Bogyiszló is a village in Hungary in Tolna county near Szekszárd. Famous for its paprika. 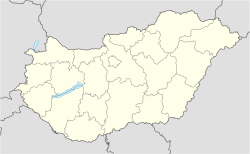 Bogyiszló is located from 11 km east from Szekszárd, in the southern part of Mezőföld, near the Danube river and Sió channel mouth. Approach: from road number 6 from west-direction, or from road number 51 from east-direction, on M9 highway, across the Danube on bridge named after Szent László. Based on archaeological finds, Bogyiszló has already been populated area in the ages of Avars. Famous breed: the Bogyiszló paprika. After cutting out floodplain forest it was easy to grow sweet paprika, and also hot pepper. The forestry, fishing and hunting are also remarkable traditions. Wikimedia Commons has media related to Bogyiszló. This Tolna location article is a stub. You can help Wikipedia by expanding it. This page was last edited on 9 July 2018, at 18:48 (UTC).